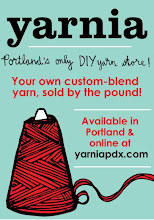 Home » CAL, events, KAL, Yarn Crawl	» Get Ready for the RCYC Knit-Along! We’ve teamed up with two fabulous local designers, Debbi Stone (The Stitches of My Life Designs) and Darla J. Fanton (Designs by Darla J) to bring you two sensational shawl designs for this year’s Mystery Along. Two very different and very Portland designs. We’ll be knitting and crocheting along to both of these mystery projects at our regular Monday Knit & Crochet Nights, beginning on February 2nd. Purchase your pattern from Ravelry. The pattern will be stored in your Ravelry library, and you’ll automatically receive an update each week when the next clue is released. Sign up on our website if you plan to knit along with us on Monday nights — that way you’ll receive any important updates or news about our weekly gatherings. Purchase your supplies. Below are the yarns we’re recommending for the Knit-Along and Crochet-Along, respectively. You may purchase your supplies through our online shop by clicking the images below, or come on in to the shop and we’ll get you all set with everything you need!